We just got hit up with an email informing us of a recent interview Jamie Madrox of Twiztid was apart of. The interview took place on the BREWtally Speaking Podcast. The episode Jamie is on also features an interview with horror icon, Bill Moseley. 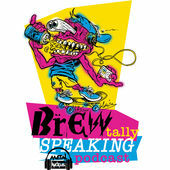 The 2nd annual Astronomicon is fast approaching, February 8th – 10th, in Sterling Heights MI, and we have a double feature for you on this episode of the BREWtally Speaking Podcast!! Bill Moseley of House of 1000 Corpses/Texas Chainsaw Massacre 2 and a slew of other films comes on first to talk about the convention culture, appearing in Detroit’s own Child Bite music video for “Vermin Mentality”. How that collaboration came about, being a part of the Housecore Records family. Reprising his role as Otis Driftwood in the upcoming Three From Hell movie. Jamie Madrox tags in for the second of this ghoulish double feature and talks about the success of last years Astronomicon, some of the struggles a first year convention goes through in trying to book talent. The guys get into a bit about what to expect from this years event, who he’s looking forward to seeing, why conventions are important as fans and SO MUCH MORE.